Aguapey Stream Basin Protection is one of the main works for the finishing of Yacyreta Reservoir Project. This Project is fundamental since its completion will impede the flooding of vast territories of the Republic of Paraguay thought the elevation of the reservoir storage level to its definitive height of 83 m above sea level. Main works consist of 64.5 km of land dams which begin in the left margin of the river in Rincon de Santa Maria, cross over the main branch where they reach a maximum height of 43 m. After covering part of Yacyreta Island, cross over Aña Cua branch, then continue through the right margin 25 km, finishing in Paraguay’s San Cosme and Damian cities. Nearby Damian city is Aguapey Stream, tributary of Parana River, which discharges an average flow of 25 m3 / s over the reservoir at a level of approximately 78 meters. The Elevation of the Reservoir to its definite storage level of 83 masl would flood Aguapey Stream Valley, generating a sub reservoir of over 450 km2 of which 360 km2 correspond to mainland and wetland, and the remaining 200 km2 corresponding to productive land. To prevent this situation, Protection Works of Aguapey Stream have been developed consisting of a land dam in the stream mouth to avoid flooding when the reservoir in filled with more than the current storage level and, a drainage channel of 12.5 km long downstream which connects with the collection channel that exists in the dam’s bottom until it reaches the Aña Cua branch. The second stage of the work consisted in the construction of Aguapey Dam with an approximate length of 4.3 km. reaching to a crest elevation over the asphalt pavement of 86.45 masl, the construction of an irrigation channel in the Paraguayan margin and the Closure of the Temporary Deviation and the Opening of Aguapey Deviation Channel simultaneously. The original Dam Project included in the bidding documents consisted on a body of soil and a blanket towards the reservoir. The Dam contained two lower clay cofferdams in the stream channel bed that along with the blanket were works performed over 14 years ago. All the leaking control in the foundation relied on the blanket and wells of relief. The Work consisted on the drainage of the sector between both cofferdams and the continuation of the Dam building works until it reaches a final profile of 86.45 masl. Before the construction started, work direction had begun, by conducting a geological-geotechnical auscultation of the stream channel, the cofferdams and the blanket, in order to reassure that the emptying of the precinct was done in a safety manner. This study was meant to contemplate the current state of the work that was going to be part of the final project, and the fact that the reservoir level was higher than the level expected when the dam was planned. As a result, the conclusion was that the bottom of the stream presented significant soil heterogeneity with important permeable sand layers and that the blanket had low waterproofing capacity. After calculations of thin matter in which filtrations and slopes stability were analyzed, the conclusion was that the central precinct couldn’t be emptied without risking siphoning effect and cofferdams failure. Even though it was possible to empty the precinct up to a level of 76.50 masl, the work between both cofferdams should be done under a strap of approximately 4 m of water. Since the blanket provided a poor water proving capability, flow lines were to be prolonged underneath the dam so as to decrease the gradients to acceptable levels. The waterproofing of the mentioned precinct through the collocation of a waterproof membrane under water. Comparative Studies were done taking into account constructive complexities, costs, work safety and construction time since there were contractual key dates related to the expected time for the elevation on the storage level of Yacyreta Reservoir. With the alternative defined, the constructive challenge was the correct placement of the waterproof membrane under a strap of approximately 4 m of water. Giving the critical conditions of the Project, after having the bottom waterproofed and before the drainage of the precinct, this one had to be filled up with sufficient weight so as to prevent a siphoning effect and stability mentioned before. Filling the area with sand coming from the Parana River was the most viable solution. The selected membrane was made up of Polyvinyl chloride of 1.2 mm. thick and a resistance of 15 Mpa according to ASTM 882. The membranes were rolled in rolls of about 1.80 m. The panels were welded by heat with controlled temperature to achieve complete fusion of juxtaposed panels, forming a single piece of the size of the precinct to be fulfilled. The joints were tested in perpendicular tension to the seam making sure that they possessed greater strength than the membrane itself. Before the placement of the waterproof membrane, another geotextile membrane was spread on the bottom to protect the former of any tearing element that may be deposited in the bed of the stream. Alter being welled, the membrane was rolled and placed over a pontoon withheld and mobilized by a hoisting engine for a controlled placement of it over the bottom of the stream. Before the filling of the precinct it was necessary to counterbalance the membrane to avoid dislocation or movements. For this reason geocells of 7.5 cm high, 1.1 mm thick of geotextile were employed as well as concrete slipped in a working platform on a maximum area of 1500 cm2 to transform them into counterweight articulated sheets. Afterwards, they were lifted with a rocker arm and collocated over the membrane with a crane. The positioning and the correct placement of the membrane as well as the geocells were inspected underwater by divers from the Consulting Consortium. Once the membrane had been counterweighted, the hydraulic filling of sand took place up to the level of the new project. Alter the filling was done, the precinct was drained to the expected levels continuing in this way with the work in the traditional way. The new design is stable even though if the membrane deteriorates or even if it disappears during the work. Something that is highly improbable. The Dam Project is completed with the construction of an irrigation channel on the Paraguayan side with a volume of 600m3 of reinforced concrete. Special Tasks had to be made for the coordination of the closure of the stream discharge over the reservoir and the simultaneous opening of Aguapey Channel. Those tasks were performed under strict supervision and having developed an Operative Plan and a Plan for Contingencies on the handling of the plug cofferdams and the Channel gates that provide all the possible contingencies and other exceptional events that could appear while the Aguapey sub reservoir drainage was done. The Project Adjustment, Inspection, Contract Administration and Work Direction were in charge of the Joint Venture COINTEC-INCONPAR-GCM-ELEPAR-GEIPEX-GCA UTE under the denomination ENERYA Consortium. The Protection of the Aguapey Stream Basin is one of the main works for the finishing of Yacyreta Reservoir Project. This Project is fundamental since its completion will impede the flooding of vast territories of the Republic of Paraguay thought the elevation of the reservoir storage level to its definitive height of 83 m above sea level. 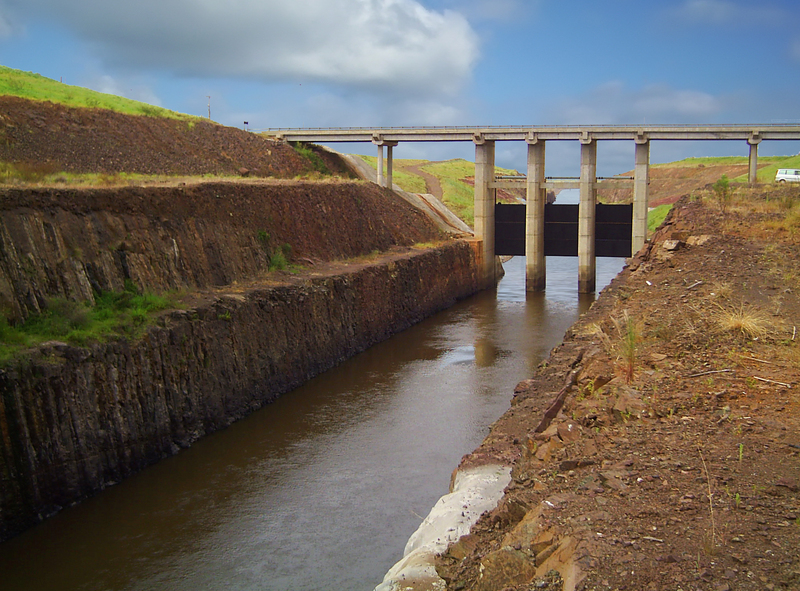 The first stage of the construction consisted on a linking channel from Aguapey stream intake position to the station 12+500 in which a junction is made between this one and the channel at the bottom of the dam in order to derive water from the stream to the discharge area in the Aña Cua branch. Construction began in the second part of the year 2005. The path of the trace was carried out mostly on clay soils, having to go through an important basalt mantle, sandstones and altered rocks between the stations 8+100 and 10+275. The first excavations in these progressives allowed us to perceive the bedding state of rocky mantles, having as a consequence important alterations that required a demanding and heterogeneous slopes project to meet the safety of all personnel and equipment employed during the process of excavation and also to meet the channel’s medium and long term stability. For this reason the degree of alteration, the jointing and the RQD of the rock mantle have been entirely analyzed and different sections have been designed to assure proper slope stability. Due to the alteration of the rock mass, blasting methods were adjusted as regards positioning, separation, depth and drilling load to the effects of making blasting works more efficient. Taking into account the deep alteration state of the rocks and sandstones present and giving prestige to the integrity of the work in its expected long lifetime, slopes that don’t require injected anchors as a means of support were decided. In some cases of deep alteration shotcrete protective paving was done. Pure soil areas were found with a few little rock outcrops up to the station 8+000. In almost every section clay soil was found and slopes and lines sections 3H: 1V were design. In these sections, excavations were done with conventional high performance equipment through traditional methods and intensive dedication. Slopes protection was done with medium rank rocks up to the berm, which is likely to get into contact with the water flow, and through a vegetable protection and stabilization drainages in superior areas that presented possibility of collapse. Channel Maximum Depth: 39.0 m.
Channel Minimum Depth: 8.0 m.
Storage level of the Channel’s Sill: 69.00 masl. The Channel is crossed by many different building works that completed the Project. One of them is the crossing of the 5B Route in the station 9+400. This route had to be relocated and re-projected and its crossing required a viaduct to bridge the irregularities caused by the channel’s slopes. In the Interjection between the route and the channel a structure was built to control the flow of water. The viaduct was design with premolded concrete beams that were mounted through the use of launching beams. The total concrete volume was 750 m3. The central section contains the Channel’s Flow Control Structure, made of four big columns that hold three flat gates set on by hydraulic mechanisms. These Gates will allow the realization of maintenance procedures downstream. The Control Structure involved the realization of 2.230 m3 of concrete. 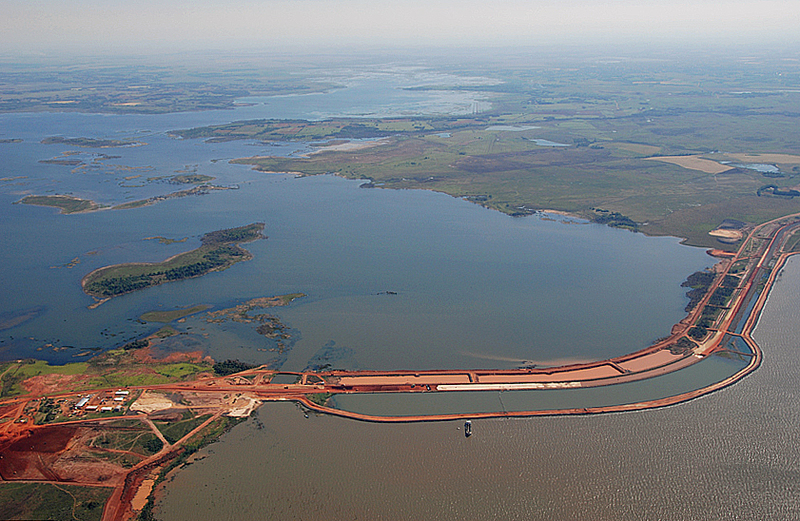 The Channel Crossings are completed by 3 bridges for animal transit and an irrigation bridge with a capacity of 108 m3 to irrigate arable land in Paraguay’s territory. Aguapey Channel’s Works were successfully completed and in the original deadlines established in December 2007, except for the Irrigation Bridge. Its construction is to be decided by Yacyreta Binational Entity in a near future. The Final Project, the Inspection, Contract Administration and the Building Work Direction were in charge of the Joint Venture COINTEC-INCONPAR-GCM-ELEPAR-GEIPEX-GCA UTE under the name of ENERYA Consortium. COINTEC, from The Argentinean Engineering Consultants Chamber (Cámara Argentina de Consultores de Ingeniería) acted as the Argentinean leading company. 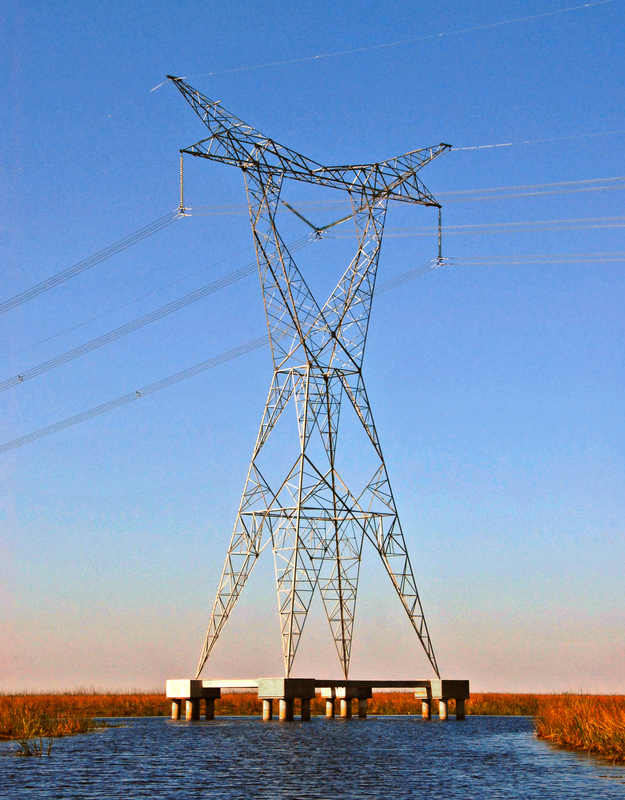 Transmission Lines and Transformer Stations in 500 kV – Interconnected National System. Due to the argentine vast territory, the existing and projected energy usage demanded the planning and construction of an Interconnected National System. 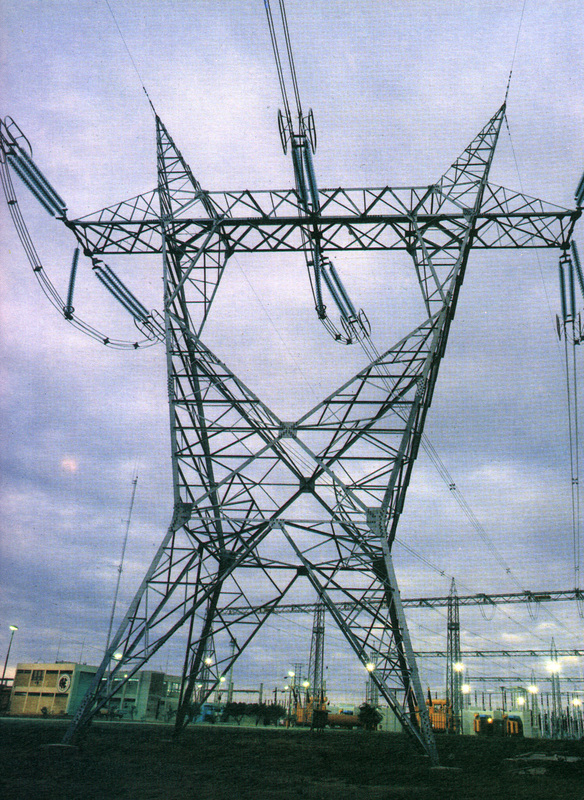 This System is constituted by an extended complex of Transmission lines and Transformer Stations in 500 kV. Approximately 6000 km of Extra High Voltage Lines and their Transformer stations have been built since 1998 and there is a project for construction of 1800 km more which is currently in process. Most of the works included in the Interconnected National System and their corresponding consulting contracts are partially financed by Banco Interamericano de Desarrollo (Inter-American Bank for Development). COINTEC in consortium with other argentine companies, was qualified by AGUA Y ENERGIA ELECTRICA (water and electric power) and by the BANCO INTERAMERICANO DE DESARROLLO (Inter-American Bank for Development) to provide consulting services on Lines and Extra High Voltage Stations. Extra High Voltage Line 500 kV. Choele Choel – West San Antonio 156 km. West San Antonio – Puerto Madryn 250 km. COINTEC has also participated intensively in works of The Interconnected System and derived works. This participation refers to the full or partial development, depending on the case, of Detail Engineering, Technical Specifications, In-Factory Inspections and/or Work Direction of 35 transmission lines and 15 Transformer stations of high and extra high voltage. Extra High Voltage Line 500 kV – Malvinas Argentinas – El Bracho. Transformer Station 500 kV – Río Grande. Transformer Station 500 kV – Gran Mendoza. Transformer Station 500 kV – Recreo. Transformer Station 500 kV – Malvinas Argentinas. Transformer Station 500 kV – Henderson – Expansion. 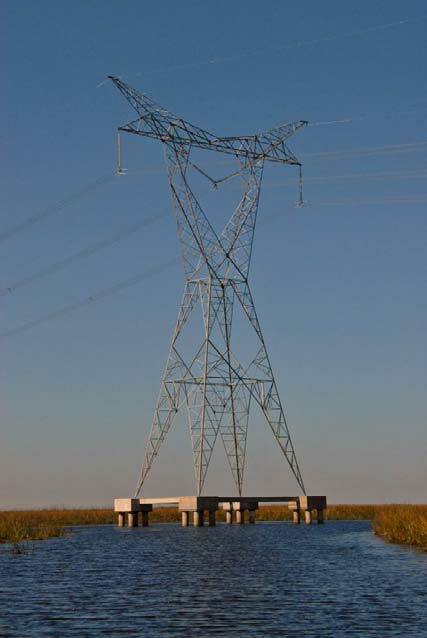 Bahia Blanca’s Thermoelectric Power Plant Maneuver Area 500 kV. Moreover, COINTEC has implemented preliminary plans for 30 transmission lines and 15 transformer stations of between 132 kV and 500 kV voltages.